If you lived during the 1980s or relish the thought of finding a time machine to go back and relive it just for the music with all of the burgeoning music technology inspired tracks, up-tempo funk tunes, cool clothes and scene void of the "must-be-gangsta-to-be-down" vibe, then you're in luck if you're a Bruno Mars fan. 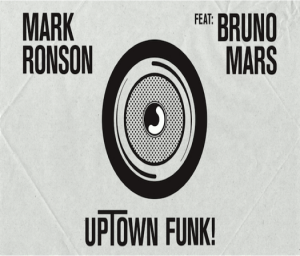 With songs like "Treasure" and "Grenade" which blew up the charts and had an retro feel to them, Bruno now comes full circle with Mark Ronson's "Uptown Funk". The song was written by Ronson, but Bruno lent his vocal stylings and appeared front and center in the song's Music Video. If you love the retro feel of the tune, then you'll love the updated 80s fashion in the video even more! Filled with deep synth basses, funky dual octave horn shout-chorus riffs and big drums with reverb smacks, you can't help but move, dance and be captivated with the suggestive, but mostly non-vulgar lyrics. If there is a guy with lots of talent, it's Bruno Mars. Mars is 5'4, plays almost a dozen instruments each with equal talent, can croon his bottom off and has fashion sense that would make most designers jealous. He was signed to Atlantic Records in 2009 after an unsuccessful stint with Motown, has enjoyed winning many Grammys and putting on a critically acclaimed Super Bowl performance. He is now considered one of the world's most successful solo artists after landing five number one singles on the Billboard Hot 100 since his career launched into full gear back in 2010. Check out the "Uptown Funk" video here.